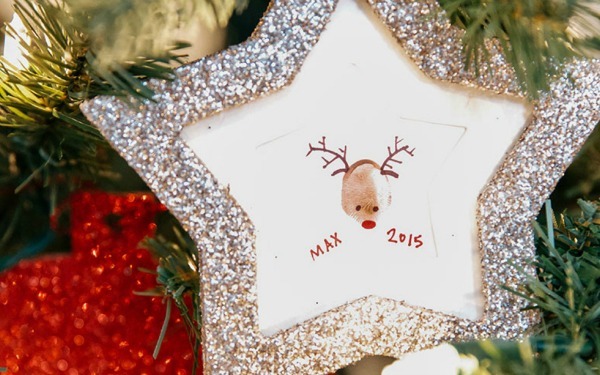 Toddler Friendly Chrsitmas Decorations - C.R.A.F.T. We are about to celebrate our 4th Chrsitmas in our current house, and our first Chrsitmas with 2 kiddos. 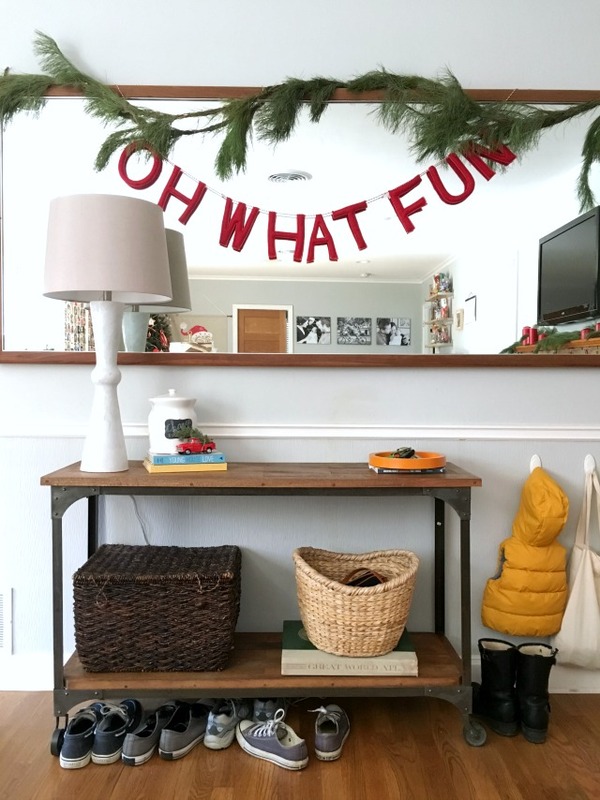 I teamed up with Esurance to share our festive, kid friendly holiday decorations. Insurance is one of those things that is no fun to talk about, but having home insurance proves to be so worth it when you need it. It’s the season for baking, building fires, and Chrsitmas lights galore, and having insurance makes me feel protected. 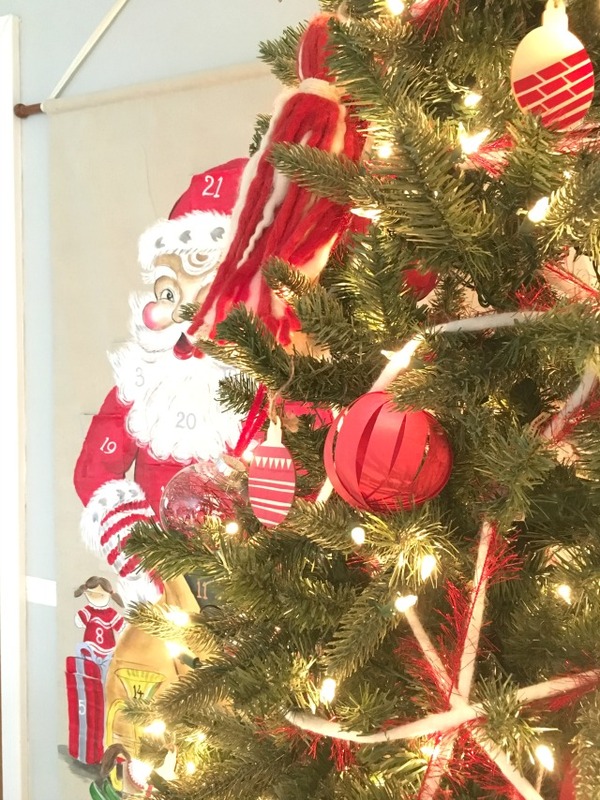 Cheers to decking the halls and making memories with your family! Psst… while you deck the halls, I highly suggest sipping on a snowman hot chocolate! I decided to wrap the tree in yarn this year. Yarn is inexpensive and not breakable, and there fore very kid friendly. The ornaments are an assortment of DIY ugly sweater inspired wooden bulbs, red paper balls, and extra large yarn tassels. 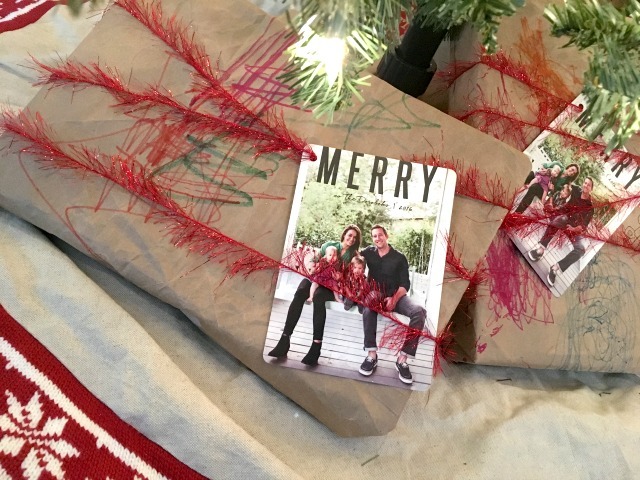 Even our gift wrap is toddler approved. I cut open a bunch of brown paper bags and let Maxwell color all of them. Then we crumpled it up and use it as wrapping paper. The gifts in the picture below are for his teachers at school so I attached our 2016 Christmas card as the gift tag. Instead of ribbon for the packages I am using the same yarn that is on the tree! 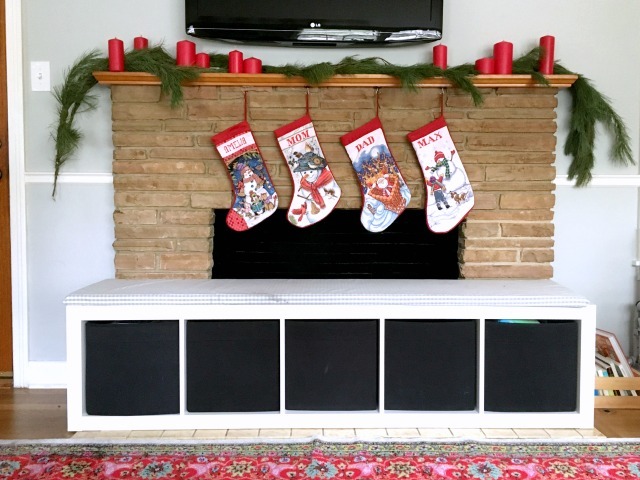 Our Christmas stockings are my very favorite! My mom cross stitched them for us, and I love how all 4 of them look together. They make my heart happy. Since we have a fake Chrsitmas tree, I decided to buy real garland so we have the Christmas smell in the air. The red candles are from IKEA. Clearly the candles can not be lit, but they look pretty up there non the less! 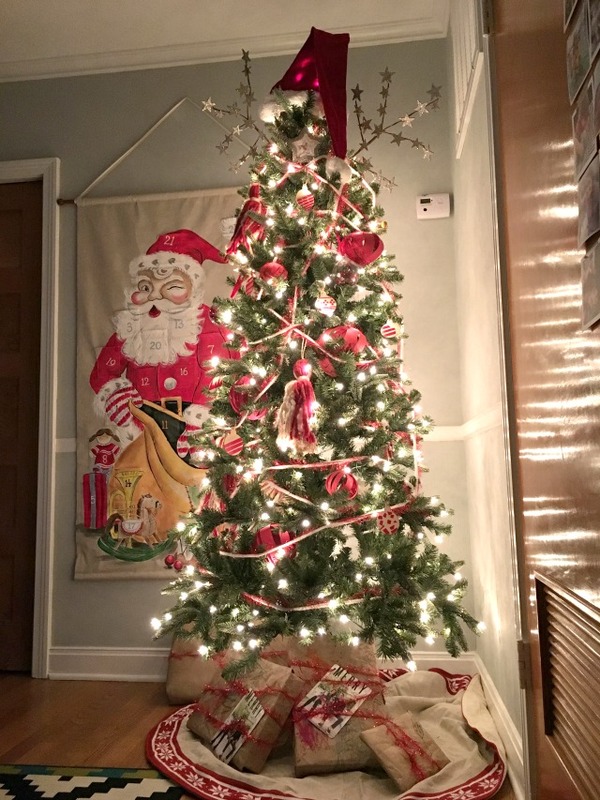 I strung a real pine garland up high where the little hands can’t reach! Oh and can you see Santa peeking out at the bottom of the mirror? Here’s a close up of the one Chrsitmas decoration on the entry table. 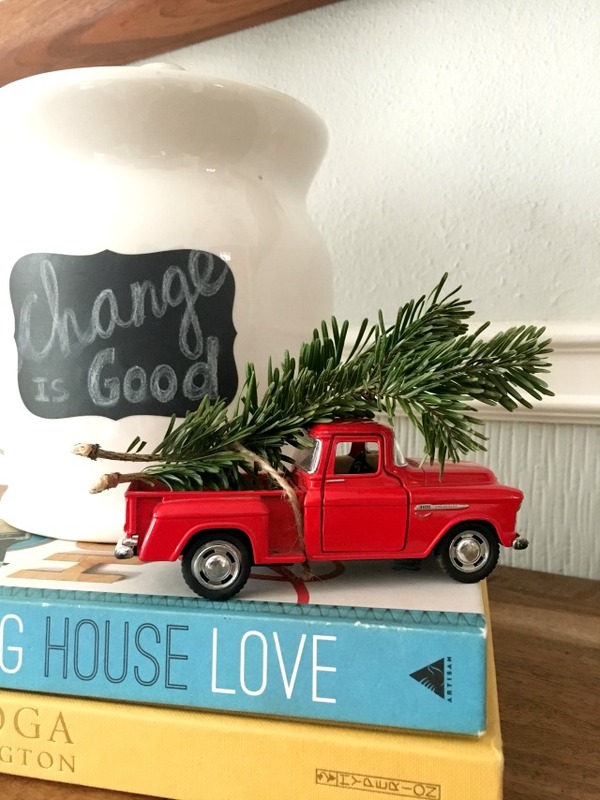 The little red truck is actually Maxwell’s and I just added a few twigs of Christmas tree I found on the ground at Home Depot, ha! And that, my fiends, is casa de Dorobek dressed up for Christmas! A giant thank you to Esurance for sponsoring this post. From quote to claim, Esurance works to help you make smarter, more efficient choices with your insurance. Using state-of-the-art technology, they offer a seamless online and mobile experience along with intuitive tools that help take the hassle out of insurance. I am super thankful that we have never actually had to make a claim, but honestly with little kids, Christmas lights, and candles galore, I am happy to know we have insurance if and when we need it!